Last spring, my niece graduated college so we did the family thing and threw a day of eating to celebrate. Her dad (my brother) Gene, and wife Deb drove all the way from North Carolina to the middle of the Great Plains where we live. Deb dashed out to the local store and grabbed a bunch of groceries to put together their contribution to the celebration. Unusual Corn Chowder was one of the dishes she prepared. Now y’all know Deb is from New England. 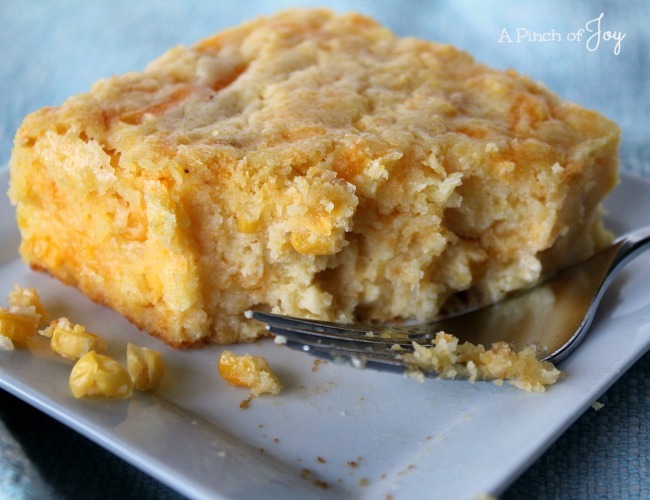 She said it’s also called Corn Pudding up in the northeastern corner of this big country. Here in the Great Plains it’s sometimes called Scalloped Corn. Although my elderly aunt once scoffed at that because “everyone knows if you scallop something, it’s got crackers in it and this doesn’t”. She called it Corn Casserole. My sister Bee calls it “that corn dish everyone likes”. Which is true. Especially since we live in the middle of corn country. This is the next best thing to corn on the cob. It’s almost that easy, too. I thought it should be Baked Corn Chowder to distinguish it from Corn Chowder soup. 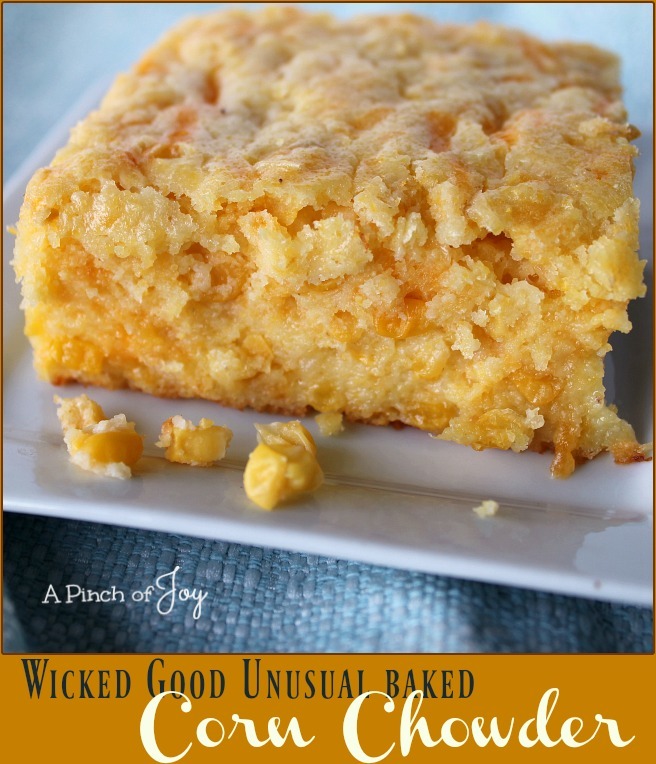 So the family name is Wicked Good Unusual Baked Corn Chowder. ‘Cause it’s my blog. I liked Deb’s recipe because she uses just half a stick (quarter cup) of butter. And when she doubled the recipe, she used three eggs. She said it was because she was making it from memory and wasn’t sure exactly what the recipe called for. I liked it because three eggs made it just a bit firmer than some of the other recipes. And doubling the recipe (with three eggs instead of two) was just right for a big family get together. Wicked Good stuff! Wicked Good Unusual Baked Corn Chowder is the next best thing to corn on the cob. It’s almost that easy, too. The difficult thing is deciding what to call this classic casserole. Preheat oven to 350 degrees. Spray or grease 8x8 pan. Stir in sour cream, melted butter, and both cans of corn. Mix well. Add Jiffy mix. Stir until it is mixed well. Bake at 350 for 45 minutes. Serve hot. To double recipe, multiply ingredients by 2 -- except eggs. Use three eggs. Bake in sprayed or greased 9x13 pan. It may take 5 - 10 minutes longer to bake. Knife will come out clean when done. I’m so glad you stopped by today! Be sure to follow A Pinch of Joy so you don’t miss a thing! Subscribe by email on the sidebar or follow on Facebook, RSS feed, bloglovin’ twitter or pinterest If you found this helpful or inspiring please share below! I’d love to have you along on this journey!